I am thrilled to have Stuart of WDW Fan Zone featured this week on Mentoring Mondays. I love the website, there is so much information there, and so many great contributors. The absolute love for all things Disney really shines through on this site. But I have to say Stuart is so nice and supportive. He is always the first to comment on the upcoming Mentoring Mondays on Facebook. He is always so positive, absolutely one of the most amazing Disney people out there. Stuart, thanks so much for sharing your knowledge with us, I am very honored to have you here. Introduce yourself and describe your website. Hi I’m Stuart Sternberg, @DisneyGeekDad on Twitter and co-founder of the WDW Fan Zone . I currently live in New Jersey with my wife and two children. Our hope is to follow our dream and someday move close to Walt Disney World. The WDW Fan Zone is an inviting community website where all Disney fans are welcome. Our columnists are group of passionate Disney fans who have come together as a family to share their knowledge and perspective of all things Disney from trip planning to its history. What inspired you to start WDW Fan Zone? 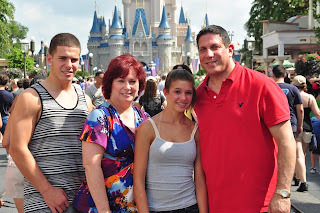 In February 2009 I started the Disney Geek Dad Blog as a way to keep the magic alive between Disney trips. Over the course of the next few months the purpose of my blog changed from keeping the magic alive to using it as a way to give back to the most wonderful community of people I have ever known. However, having my own blog wasn’t enough for me. I wanted to reach more people and find a way to do more for the community while giving others an outlet to express themselves. So, along with Lisa Battista we founded the WDW Fan Zone. I think the best way to attract new readers and followers is by having a good product and maintaining a good product but, most importantly by word of mouth from your readers, writers, and friends. I have to say the best advice was my own to pursue my dream to start the WDW Fan Zone. Since Lisa Battista and I never sought the advice of others there is no bad or worst advice to mention. I think the biggest mistake most new bloggers make is that they will publish one or two posts to their blog then disappear for a weeks before returning with a new post. For a blogger to be relevant and build a readership they have to regularly publish new articles. I think social networking is very important to blogging. It’s a way for people to get to know who you are and what your blog is all about. My best advice to get followers/likes is get involved in conversation, be yourself, and let it happen naturally. Do you thing being a male blogger is an advantage/disadvantage and why/why not? I never thought of myself as a male blogger. I’m just someone who loves Disney, the Disney community, and writing about it. What attributes do you look for when choosing a columnist? I just go with my gut instincts when choosing a columnist and I think that has worked out very well. We have a great group of writers and I am so proud of every single one of them for their amazing contributions. What is your favorite Disney Vacation memory? I actually have two favorite Disney vacation memories. The first took place in June of 2001. At the time my son was 8 and my daughter was 5. We were waiting in Disney’s Hollywood Studios then known as Disney MGM Studios to meet up with my brother’s family. As we were waiting Snow White came out of nowhere and walked over to my children. She was so warm and friendly to my children and although it was a brief conversation it was long enough to leave a lasting impression. My other favorite Disney memory was the entire Lou Mongello WDW Radio Dream Cruise. It was the greatest non-Disney World theme park vacation I’ve ever been on. It was a humungous family gathering and one in which so many life lasting friendships were made. Whether or not you are a seasoned veteran of the Disney parks managing your time to get the most out of your trip and to have a great vacation takes research, planning, and organization. Always develop a touring plan for your Disney trip. There are several excellent guide books available and a number of great websites such as AllEars.net, TouringPlans.com, and PassPorter.com providing excellent advice and assistance in planning your vacation. There has been a tremendous growth in the Disney community since I started getting involved a little over two years ago. I love seeing friends and new comers to the community taking an active part in it whether it’s starting their own website, blog, podcast, or just contributing to one. The Disney community has endless boundaries with room for everyone to add their own touch. My hope is more and more people will become actively involved. Donna Kay I wish you the very best of luck with your blog and I am truly honored that you thought to include me as a participant in your Mentoring Mondays. Thank you so very much! Thank you, Stuart, for sharing! Stuart! I've been anxiously awaiting your interview :) I can vouch that Stuart follows his own advice. He is always himself and is genuine and sincere. He loves to interact with fellow Disney fans and it shows! Great post! Stuart is *the* reason I started my own blog and write for he & Lisa's site. His encouragement and friendship have been such an important part of coming out of my shell and sharing my love of Disney. Thank you so much for taking the time to show others what an amazing person he is. Another great interview Donna!! Thank you Stuart for sharing your thoughts with us!! Great post! I loved reading about the history of Stuart's blogs. WDW Fan Zone is comprehensive, thorough and always a great read; no wonder its grown so far so fast!! I have really enjoyed this interview too. Another great Q & A, i always learn something.